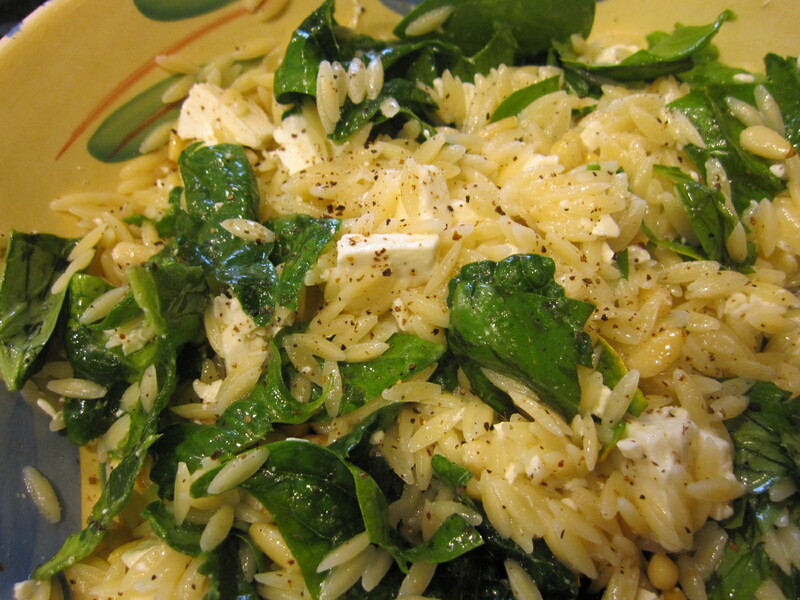 A Perfect Pasta Salad: Basil-Feta-Orzo-Spinach Summer Salad | Laura's "Rules"
This is a family recipe, so much so that its origins are lost in the mists of time. I think I can claim having discovered it first, but I wouldn’t want to wager (much) on that. Regardless, it’s now for me what summer tastes like. This salad is a terrific setting for basil from the back garden, because it’s almost like a deconstructed pesto. It’s wonderful with chicken, and is also a great-tasting, unfussy dish for a party or barbeque. Put the pasta water on with a good dash of olive oil and salt and set to a boil. Prep the first four ingredients in a bowl large enough to fit both them and the cooked pasta. Cook the pasta as directed and drain. While still hot, add to the bowl. 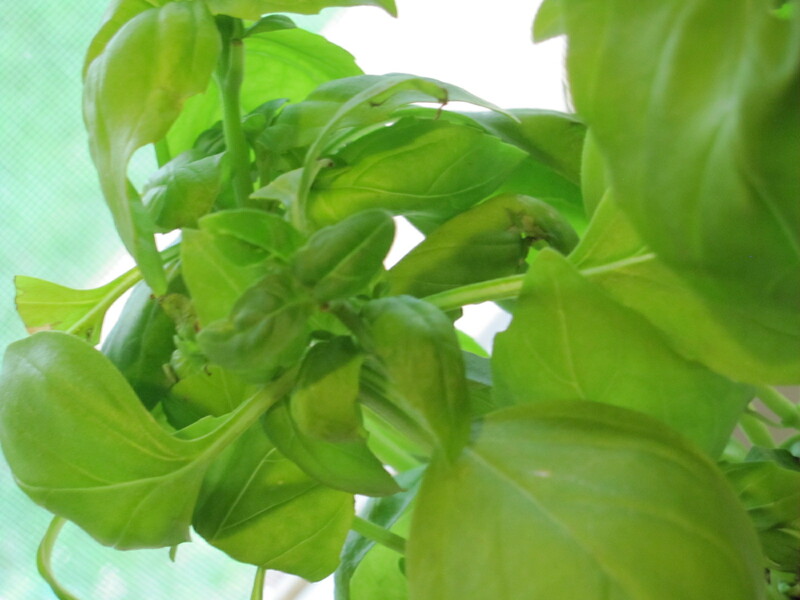 After several minutes of letting the ingredients warm up and the spinach and basil begin to wilt, toss the pasta with the ingredients and add olive oil and fresh pepper to taste. Enjoy warm or cold. 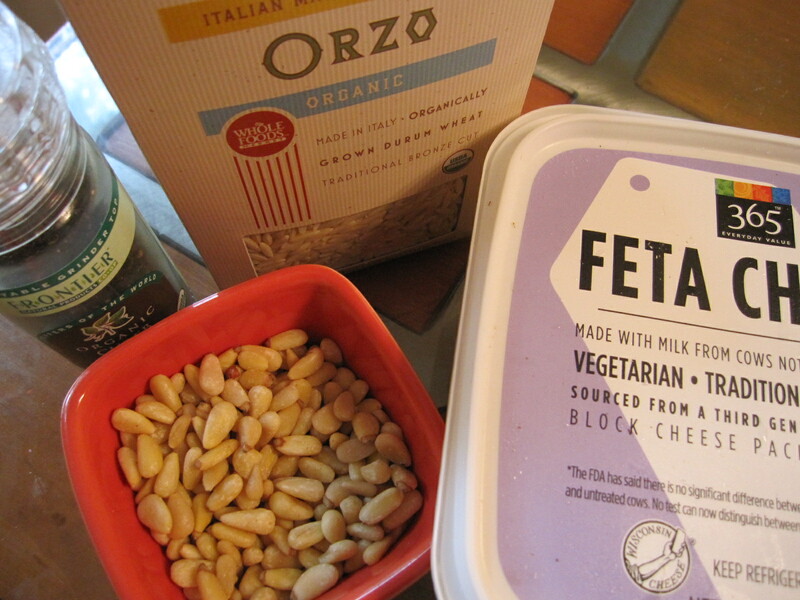 This entry was posted in Recipes & DIY and tagged Black pepper, cook, dinner, environmental health, Feta, food, green, health, healthy, Ingredient, mommy blog, Olive oil, organic, orzo, Pasta, pasta salad, recipe, salad for BBQ, spinach, summer salad by Laura MacCleery. Bookmark the permalink. Loved this! So yummy for lunch. Easy to make and requires few ingredients which makes it the perfect meal for me. 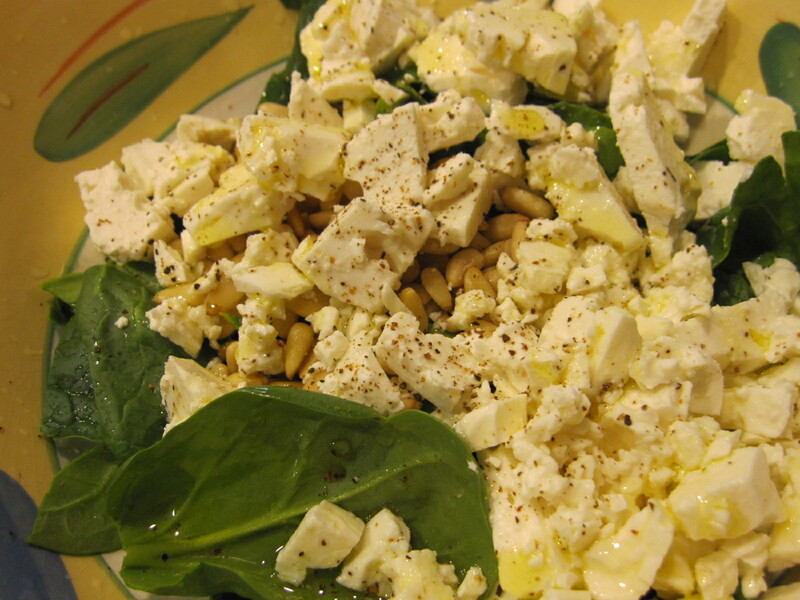 I make the same salad, warm, but I cook red and orange, and green pepper, shallots, and some onion until softened, add olives, give it a minute or so and stir into the warm pasta with the basil, fresh spinach, and feta already in. Dress it with generous spoons of fresh lemon juice, black pepper and salt if required (the feta’s already salty) Its Delicious!! First warm, then cold, then right out of the refrigerator container. Gotta hide it though, cause its not going to last long. If you want to make a more substantial meal of it, then saute some shrimp with shallots, black pepper, salt, and lemon juice and toss in the salad. Yummy! Thanks so much for the great suggestions! Sounds delicious!! Made this last night and it is awesome!! There’s a big bowl of it in our fridge right now and, unless Mark digs in while I’m at work today, I’m looking forward to having it for dinner. Thank you for sharing this one! That’s great! I’m so glad to hear you’re enjoying it. I have to have this soon. The photo is fantastic. I like that you used the orzo to wilt the salad and blend all the ingredients. Fantastic salad. Thanks! You won’t be disappointed. And it’s so easy.